A Level results day is just around the corner. To make sure your family is prepared, this guide will take you through all of the essential details of the big day and explain the various options available to your child once they have received their results. If you have any questions about A Level results day or wish to discuss the steps your child should take after receiving their results, please call one of our education consultants today. A Level Results are released on Thursday 15th August 2019. How do we collect the results? Pick up your child’s results from their school on the day. Request for their results to be sent by post. Nominate a friend of family member of your family to pick them up on your behalf. Many schools will publish the results on their Internet portal. Please remember to confirm how you would like to pick up the results with the school. When will we find out if my child has got into their chosen university? Universities receive A Level results a day or two before schools. They will often accept or reject conditional offers before your child has even received their grades. We suggest you check UCAS ‘Track’ from 8am on results day morning to find out whether your child’s place has been accepted. Not only can this relieve the pressure, but it will also give you a good indication of their final grades. If your place is confirmed, UCAS will send you your AS12 letter via email which will explain your next steps. What happens if your child meets the results of their ‘firm’ university offer? Congratulations! The hard work has paid off. It’s time to celebrate with your son or daughter. Don’t worry about contacting their first-choice university to confirm their grades, as UCAS ‘Track’ will automatically update soon after results are released to show that they have been accepted onto their chosen course. Only if this doesn’t show after a few days, will you need to contact the university. After results day, an ‘AS12’ letter will arrive in the post. Ensure that your child follows any instructions carefully, and holds onto the letter for safekeeping. You can then begin preparing your child’s move to university. What happens if they don’t meet the results of their ‘firm’ university offer? It is important for you all to remain positive, even if you are disappointed. There are still plenty of options if they have missed the grades for their ‘firm’ choice and there is no need to panic. If their results look peculiar, for example if one module mark is significantly lower than the rest, or if a result is very close to a higher UMA grade boundary, it might be worth considering a priority marking review to determine whether there has been a mistake. Unfortunately, universities are not required to a hold a place whilst the paper is remarked but do consult with the University beforehand. However, it is rare that universities will still accept students who have not reached their offer grades. Rather, it is more likely that your child will be offered a place with their ‘insurance’ university. In this case, no action is needed on results day. Simply fill out a ‘change of circumstances (CO1)’ form on the student finance website within the next few days. What happens if my child child doesn’t meet the results for their ‘insurance’ university offer? If your child doesn’t achieve the grades required for their ‘insurance’ university offer, they may be able to find another place through UCAS ‘Clearing.’ Each year, The Telegraph and UCAS website, provide a full listing of ‘Clearing’ vacancies. How does UCAS ‘Clearing’ work? Most of the ‘Clearing’ process will take place over the telephone and your son or daughter will need to contact individual university admissions departments. It is important not to rush ‘Clearing’. It is an important decision which will determine the next three years and beyond. Your child can contact as many ‘Clearing’ universities as they wish in order to weigh up their options. Once they have received a verbal offer over the telephone, they must enter the course and institution codes into UCAS Track. If the ‘insurance’ or ‘Clearing’ universities are not quite right for your son or daughter, they might consider the option of a ‘gap year’. This could allow them to explore a range of options, including retaking a portion of their A levels and reapplying for the following year through UCAS. 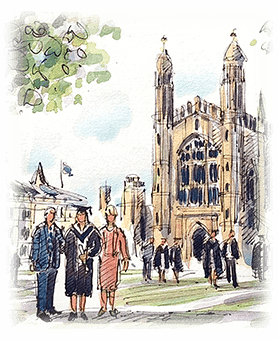 Whilst Oxbridge might not accept reapplications, many Russell Group Universities may do. A ‘gap year’ will also give your child an opportunity to travel, volunteer, or work on other pursuits and projects. What should we do if they exceed the results of their university offer? After registering on the UCAS website, they will need to search individual university websites before contacting admissions offices, who will inform your child if there are any vacancies. If they receive an offer they would like to take, they can accept this over the phone; the university will update their UCAS account. Once registered with ‘Adjustment’, you have 5 days to find a place, so there is no need to rush. Instead, sit down together and consider options, perhaps ranking potential universities before contacting them. An educational consultant, if required, could help you make these decisions, offering information on university quality and prestige. You may also wish to speak to a friend’s child who has been to that university. If you need any advice on resits or help determining the next steps for your child, our education offer expert and independent advice. Please visit our Education Consultants page to learn more about our award winning service.